Along with bat boxes, there are other ways to attract bats to your garden. Use the following tips and you could find yourself spending many an enjoyable evening watching these furry mammals as they whiz through the air. Insects pollinate many flower species. 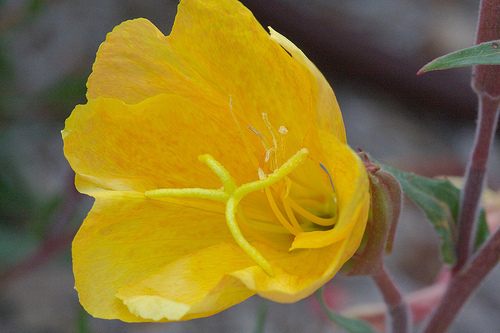 To attract bats, try planting night-scented varieties like this evening primrose (photo by John Norton) to attract the night-flying insects that will be out when bats are hunting. 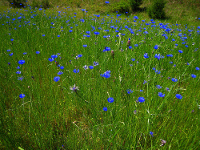 Stick to native, wild flower species if you can because they form part of your environment's natural ecosystem. And this means more insect species will be adapted to feed on them. Some lovely examples of night-scented flowers (that are native to the UK) are Corn Chamomile, Soapwort, Cornflower and Cowslip. 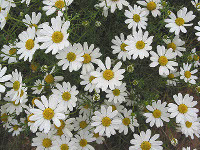 Variety in the shapes of the flowers that you plant will also bring in different types of insect. For example, long, narrow, tubular flowers like Red Valerian and White Campion can only be pollinated by insects with long tongues like so me moth and butterfly species. Flowering plants like Sweet Cicely make it easy for insects to land on them because they've got landing platforms and make a valuable addition to a bat garden. And if you've ever wanted a good excuse not to mow at least part of your lawn, here it is. Many insect larvae need the food and shelter provided by unmown grass. So perhaps leave part of your garden to grow wild, and if you want to make it prettier, why not sow some wild flower seeds and turn it into a wild flower meadow?! Small trees like the Hawthorn support a wide variety of insects and make an excellent addition to a garden or hedge. Trees also provide roosting opportunities for bats. They also use linear features like hedges as navigation guides between places like their roosts and feeding areas. As with flowers, native species are more likely to attract more insects. These provide water for bats to drink and are also a source of insect life. Many insects, like the May fly, start their life cycles in water. And some bats such as the Daubenton's prefer to roost near to bodies of water. These can be very harmful to bats in two ways so avoid them if you can. They reduce the variety and amount of insects and can also be fatal to bats. 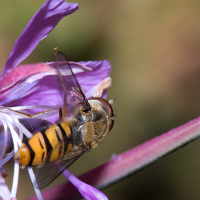 Insects like the hoverfly (photo by Louise Paisely) are natural predators of many garden pests. By planting their food plants such as Yarrow and Wild Carrot, you'll have a very natural form of pest control. Another way to protect your plants is to use the permaculture technique of companion planting. An example of this is growing marigolds around your tomatoes.